Economic growth is not a goal in itself but only a means to improving the well-being of a nation’s population. Yet GDP growth is too often taken to be the key measure of performance. Tracking economic growth does make sense, but focusing on it alone misses the point. Of course, countries growing at a robust rate have an expanding pool of resources, and that provides a great foundation on which to build. But the conversion of wealth and economic growth into well-being is not automatic, and it occurs very differently from country to country. Tracking measures other than GDP is critical to understanding how a country is converting its wealth into well-being and its economic growth into improvements in well-being. Such an understanding can then set the stage for policies and actions aimed at making the most of wealth and economic growth. An Interactive Guide to Sustainable Economic Development. BCG’s Sustainable Economic Development Assessment (SEDA) was designed to measure well-being and to track countries’ relative performance in converting their wealth into the well-being of their people. (See “Defining and Measuring Well-Being.”) Our 2017 analysis of the most recent data available for 162 countries around the globe reveals which countries are leading the pack—and which are trailing—when it comes to that conversion.1 This year’s analysis also highlighted the fact that the rate at which countries convert wealth into well-being changes very little over time. So while income and growth rates may rise or fall, a country’s effectiveness at harnessing wealth to deliver well-being changes only gradually—often despite concerted efforts to do so. This finding holds true for all the countries in our data set, including the 35 countries with the largest populations and/or the largest economies. Our data set comprises 161 countries plus Hong Kong, which is a special administrative region of China. For the sake of simplicity, we refer to all of these entities as countries. Many economists, including Nobel laureates Amartya Sen, Michael Spence, and Joseph Stiglitz, argue that placing well-being at the center of policies and public investment priorities requires incentives that go beyond economics and, most important, measures to track progress. 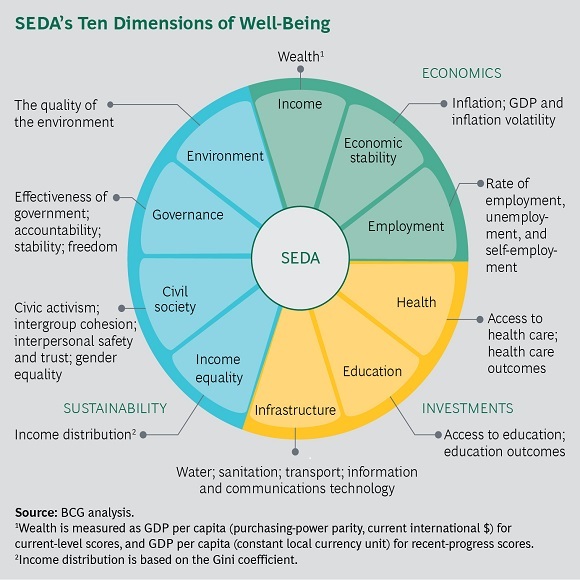 In 2012, The Boston Consulting Group proposed SEDA as a new means to measure well-being. SEDA combines objective data on outcomes, such as in health and education, with other inputs, such as expert assessments of governance. It is also a relative measure that assesses how a country performs compared with either the entire universe of 162 countries or individual peers or groups. SEDA offers a current snapshot as well as a measure of progress over time, and it is designed to complement purely economic indicators like GDP. Economics includes the dimensions of income, as well as economic stability and employment. Sustainability comprises the environment and three contributors to social inclusion: income equality, a strong civil society, and sound governance. We then aggregate the scores for the ten SEDA dimensions to provide an overall current-level and recent-progress score for each country. These two scores can be used to compare a country with any other country or group of countries. In general, wealthier countries tend to have higher current-level scores than less wealthy countries. But when it comes to recent-progress scores, there is no obvious pattern related to income or to any other dimension, since these scores reflect the socioeconomic dynamics—including policy effectiveness—in different countries. SEDA’s ten dimensions also provide an organizing structure for reviewing priorities for remedial action, since a country’s performance relative to the rest of the world or a group of peers can highlight critical strengths and weaknesses. Armed with such insights, governments can begin to set strategies for addressing the most pressing issues. The wealth to well-being coefficient compares a country’s SEDA score for its current level of well-being with the score that would be expected given the country’s GDP per capita and the average relationship between that measure and the worldwide current-level scores of well-being. The coefficient thus provides a relative indicator of how well a country has converted its wealth into the well-being of its population. Countries that have a coefficient greater than 1.0 deliver higher levels of well-being than would be expected given their GDP levels, while those below 1.0 deliver lower levels of well-being than would be expected. The growth to well-being coefficient compares a country’s SEDA score for recent progress with the score that would be expected given the country’s GDP growth rate and given the average relationship between recent-progress scores and GDP growth rates during the same period for all countries. The coefficient therefore shows how well a country has translated income growth into improved well-being. As with the wealth to well-being coefficient, countries that have a coefficient greater than 1.0 are producing improvements in well-being beyond what would be expected given their GDP growth rate from 2006 to 2015. The phenomenon is likely due in large part to the fact that, as a large body of research has shown, most of the institutions that underpin a society, and which are central to harnessing growth to improve well-being, themselves change only slowly. For example, civil society and governance—essential factors in the sustainability of well-being—are greatly affected by the strength and vitality of a nation’s institutions (as reflected, for instance, in the rule of law and civic activism). And in every year that we have performed the SEDA analysis, we have found that countries that perform poorly in terms of converting wealth into well-being also tend to have low scores on those dimensions of well-being. Furthermore, this year’s analysis reveals that income inequality is a critical factor as well, with high levels linked to weaker performance in converting wealth into well-being. Civil society, governance, and income equality are all important factors in the overall level of a society’s inclusiveness. The bottom line is that countries characterized by greater inclusiveness are better able to harness their wealth and growth to deliver well-being to their populations. Of course, none of this means that GDP and GDP growth rates are not key measures of national development. In the second half of the 20th century, huge gaps in per capita income developed in many countries. Narrowing that gap remains a major challenge for many of them, but for many others—including some with very large populations—there is an even more pressing issue. Although economic growth has boosted average per capita GDP levels significantly, income inequality has increased and large segments of the population have been disappointed in their expectations for a rising standard of living. This shift has far-reaching implications, including a potential retreat from the free flow of goods and services that has been a major driver of prosperity—including GDP growth—over the past two decades. To address this challenge, national strategies must more explicitly treat well-being as a central goal and ensure that the benefits of globalization are shared widely. And government leaders must examine what is keeping their country from effectively converting wealth into well-being and preventing globalization from being a force for inclusion. Such insights can help them identify the institutions that need to be improved, paving the way for a sustained effort that can move the needle on well-being for current and future generations. By looking at a country’s current-level and recent progress SEDA scores, we can see how it compares with other countries in terms of its existing level of well-being and the progress it has shown in improving well-being over the last nine years. Exhibit 1 shows the greatly varying results for all 162 countries covered in our latest SEDA update. The position of countries within these quadrants is revealing. Although countries that had lower levels of well-being at the beginning of the period used to calculate recent progress (2006–2015) had more room for improvement, they are not necessarily the ones that have made the most progress. While a good number of countries have low current-level and high recent-progress scores—those in the “weak but improving” quadrant—there are a significant number in the “weak and losing ground” quadrant. Similarly, some countries with high current-level scores have still managed to chalk up strong recent progress, landing them in the “good and improving” quadrant. Questions about our analyses and findings often center on the world’s major economies. Therefore, our latest update—in addition to covering all 162 countries as usual—focuses on a subset of the 25 largest economies and the 25 most populous countries. Because some countries fall into both categories, we are left with a set of 35 nations, which account for about 86% of the global economy and 79% of the world’s population. Like the larger group, these countries are distributed over the four quadrants shown in Exhibit 1. And while the quadrant into which a country falls provides a useful snapshot, it is also important to consider location within a quadrant. Thus, Germany, Switzerland, and the Netherlands—all in the “good but losing ground” quadrant—have the highest current-level scores and are close to the global median on recent progress; in the same quadrant, Italy, Spain, and France likewise have high current-level scores, but their recent progress, if any, is well below the global median. Similarly, in the “weak but improving” quadrant, Indonesia and Vietnam have been making strong progress and have well-being levels very close to the global median, while Nigeria has a much lower current-level score and its recent progress is only a bit above the global median. The ability to assess how well countries are converting their wealth (income) into well-being for their citizens is the source of SEDA’s most powerful insights. The striking differences among countries are reflected in the wealth to well-being coefficient, which provides an indicator of a country’s success at harnessing its wealth relative to the global average; coefficients above 1 indicate above-par performance and coefficients below 1 mean that the country is converting its wealth into well-being at a rate below par. As in the past, our analysis shows no evidence of a relationship between a country’s wealth and the rate at which it converts that wealth into well-being for its citizens. So there are significant differences in conversion rates even among countries with similar levels of per capita income. (See Exhibit 2.) GDP per capita in Indonesia and South Africa, for instance, is quite similar (at around $12,000), but Indonesia is converting that wealth into well-being at a rate above the global average—that is, its wealth to well-being coefficient is relatively high—while South Africa’s conversion rate is greatly below par. As noted above, we found that income inequality is a major factor in weaker performance in converting wealth into well-being. South Africa has the lowest current-level score on income equality among the 35 countries in our subset, while Indonesia’s score of 57 is well above the global median. Income inequality often correlates with performance in other dimensions of well-being, such as access to basic social services. Thus, South Africa has much weaker scores on health and education—32 and 30, respectively—compared with Indonesia, which scored 54 in health and 52 in education. The gap in scores for employment was similar—21 for South Africa and 44 for Indonesia—suggesting that equality of opportunity, too, is much greater in Indonesia than in South Africa. While the wealth to well-being coefficient provides a snapshot of a country’s current ability to harness wealth, reflecting the legacy of its history of policy decisions, the growth to well-being coefficient zeroes in on how well it has converted income growth into improved well-being (as measured by recent progress) since 2006. Our analysis of the recent progress of all 162 countries in our data set indicates that even countries whose GDP is growing at a similar rate may convert that economic growth into well-being improvements at very different rates. (See Exhibit 3.) For example, Canada, Germany, Russia, Sweden, Switzerland, the UK, and the US all grew at an average rate of 1% to 2% during the 2006–2015 period, but only Germany and Switzerland were able to convert that growth into improvements in well-being at significantly above-par rates. Japan and France grew their GDP at a similarly slow pace (less than 1% per year), but Japan managed to convert its growth into improvements in well-being at an above-par rate, while France did not. This difference was due in part to the recent-progress performance of both countries in terms of employment and income equality, with Japan posting progress equal to or above the global median and France performing below the median in both dimensions. Among the fastest-growing countries, China, Indonesia, and Vietnam all succeeded in converting growth into well-being at slightly above-par rates—which was quite an accomplishment given their high growth rates. India was not far behind, growing very rapidly and converting that growth into well-being improvements at rates only just below par. Combining the static view provided by the wealth to well-being coefficient with the dynamic view provided by the growth to well-being coefficient can produce valuable insights. Sometimes the two perspectives show a consistently positive trend. For instance, China and South Korea have slightly above-par coefficients in both wealth and growth. But sometimes the growth coefficient can raise a red flag, signaling a potential deterioration in a country’s well-being as measured by its current-level SEDA score; the UK, for example, has a wealth to well-being coefficient that is well above par but a growth coefficient that is well below par. In other cases, the growth coefficient can suggest a potential positive change in direction; Turkey, for example, has a below-par wealth coefficient but a growth coefficient that is well above par. The 35 countries in our subgroup are fairly well dispersed when mapped against both the wealth to well-being and growth to well-being coefficients. (See Exhibit 4.) Germany, the Netherlands, the Philippines, Poland, and Switzerland stand out among the best-performing countries, with well above-par performance in both wealth and growth. Brazil, while not yet converting wealth into well-being at par, is noteworthy because its success in converting solid growth into significant improvements in well-being has gradually pushed the country’s wealth to well-being coefficient almost up to par. France and the US, meanwhile, have slightly above-par wealth to well-being coefficients but significantly below-par growth to well-being coefficients. Compounding the challenges for both countries is the fact that they are growing rather slowly. Failure to convert that weak growth into well-being at even average rates—the consequence, in part, of limited progress in improving health and infrastructure—is producing very unimpressive improvements in well-being for the citizens of these two countries. Countries with below-par conversion of both wealth and growth into well-being represent diverse regions and reflect the impact of varying dynamics. Their challenged position may be due to persistent structural factors (as in the case of Argentina and Mexico), prolonged economic crisis (Italy), or social and political turmoil (the Democratic Republic of Congo, Pakistan, and Thailand). From this perspective, Egypt and Nigeria appear to face the greatest challenges among our group of major countries. Egypt’s wealth coefficient is slightly below par and its growth coefficient is very weak (the worst of the 35 countries). Nigeria’s wealth coefficient is greatly below par (the worst of the 35) and its growth coefficient is below par. As noted above, research shows that most national institutions tend to change slowly, which is probably a key reason for the slow progress of a country’s ability to convert wealth into well-being. And since civil society and governance are especially reliant on the strength of those institutions, it is not surprising that countries with low scores in these dimensions of well-being tend to perform below par at converting wealth into well-being. In this year’s analysis, therefore, we took a close look at the link between income inequality and well-being. The most common assumption about income inequality—and the view of many experts—is that it has a negative effect on a country’s overall living standard and on citizens’ sense of well-being. As overall inequality increases, not only does the gap between average incomes and the incomes of the less wealthy increase, but gaps also grow in access to education, health care, and other key components of well-being. If inequality does in fact have a detrimental impact on a country’s level of well-being relative to its income level, we would expect to find a negative correlation between the two. To explore the relationship between levels of inequality and well-being, we relied on SEDA’s wealth to well-being coefficient rather than on SEDA’s current-level score. The coefficient provides a way to control for the important effect of income on well-being and for the fact that income equality is one of the ten dimensions that SEDA uses to define well-being. A clear correlation between the coefficient and inequality would indicate that countries with higher levels of inequality do worse at converting their wealth into well-being—independently of their income level. We found three types of statistical confirmation of the negative relationship between inequality and the wealth to well-being coefficient. First, regression analysis shows the negative correlation between the two measures to be statistically significant, with a confidence level above 99.5%. Second, we divided the 162 countries in our SEDA database into three tiers of roughly equal size (those with wealth to well-being coefficients near the average and those above and below).2 For each tier, we looked at the average Gini index, a measure of income inequality in which the higher the number, the greater the inequality. We found that the Gini index is lowest, at 35.4, for countries converting wealth into well-being at above-average rates and highest, at 42.6, for countries converting wealth into well-being at below-average rates. The index for countries converting wealth into well-being at about the average rate is in the middle, at 37. Interestingly, the gap between the Gini index for the middle tier and the Gini index for the bottom tier is greater than the gap between the Gini index for the middle tier and for the top tier. This suggests that there might be a threshold beyond which inequality has particularly pernicious effects. Finally, we looked at the mirror image of this relationship. Dividing the 162 countries into three tiers of equal size on the basis of Gini index, we found that countries in the middle tier (with inequality levels near the median) have a wealth to well-being coefficient of 1 (meaning that as a group, they convert wealth into well-being at par), while countries characterized by greater inequality have a coefficient of 0.9 (underperforming in the conversion of wealth into well-being) and countries characterized by less inequality have an average wealth to well-being coefficient of 1.1. (See Exhibit 5.) Given the nature and scale of the coefficients, these are very significant differences. We deemed countries with coefficients between .935 and 1.065 to be converting wealth into well-being at roughly average rates. This evidence clearly indicates that income inequality is a drag on the ability to convert wealth into well-being, a finding with far-reaching implications. (See, “Unequal and Unhappy.”) The important connection between equality and well-being, along with the impact of a strong civil society and sound governance on a country’s ability to convert wealth into well-being, point to the areas on which government leaders should focus. Are people in countries with higher levels of income inequality less happy than they would otherwise be expected to be? We then looked at whether the gap between well-being and happiness is strongly correlated with income inequality (as measured by the Gini index). We found that countries with high levels of income inequality tend to have a larger gap between well-being and happiness. 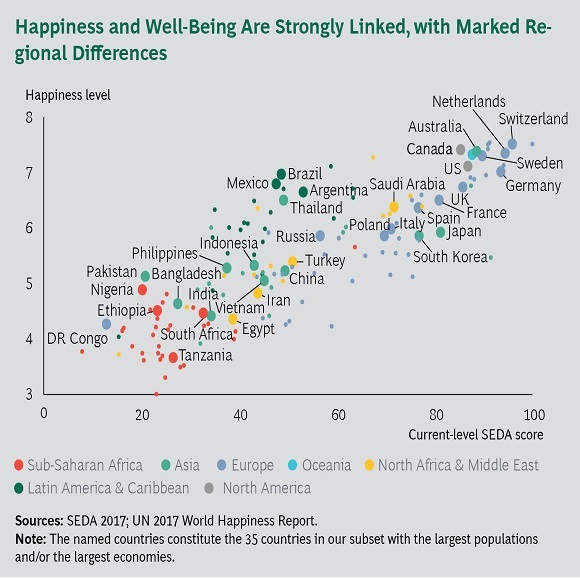 Conversely, countries with low levels of inequality tend to report levels of happiness higher than what SEDA’s more objective measure of well-being would suggest. Of course, factors other than inequality are at work when it comes to happiness versus well-being. For example, there are clear patterns related to cultural differences. Latin Americans tend to be optimistic (their happiness levels are higher than would be expected given the well-being scores of their respective countries), while the opposite is true for Central and Eastern Europeans. And the happiness scores of East Asians are quite consistent with the well-being scores of their respective countries. Similar variations occur from country to country. South Korea and Spain have very similar well-being scores, but Spaniards report being considerably happier than South Koreans. Thailand has a slightly lower well-being score than Turkey, but Thais report being considerably happier than Turks. Similarly, Canadians report being much happier than the British in spite of having slightly lower scores on well-being. It’s important to note that neither subjective measures of happiness nor SEDA’s more objective measure of well-being effectively captures people’s sense of opportunity—what those in a particular country think about their future prospects. This factor is often overlooked and it is likely crucial in determining whether people are happier or less happy than the current state of well-being in their country would seem to warrant. Inclusive growth—prosperity that is widespread within and across countries—is a critical global challenge. How a nation converts its current wealth and economic growth into well-being is a telling indicator of progress toward inclusion. This is true for fast-growing countries with young populations and a lot of catching up to do in terms of income per capita, as well as for slow-growing, wealthy countries with aging populations—and for every country in between. Well-being is a function of many different factors. Our SEDA analyses suggest that there is a close relationship between a society’s inclusiveness—as reflected in income equality and in the quality of civil society and governance—and its ability to convert wealth into well-being. And given the impact of strong institutions on all three factors, it is clear that countries that want to improve how they harness their wealth must examine and address fundamental flaws in those institutions.